Wildwood Chesapeake Bay Retrievers breeds this majestic breed. 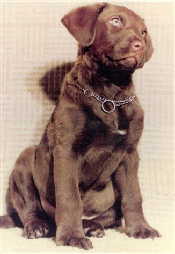 This amazing breed is a great hunter and Wildwood produces a high quality Chesapeake Bay Retriever. They are true to breeding the Chesapeake Bay Retriever and keeping it to its original purpose of hunting in harsh conditions and cold water. Visit their website for more information about this breed and the available Chesapeake Bay Retriever puppies for sale at Wildwood Chesapeake Bay Retrievers.